In my opinion, Wilder Ranch deserves to be ranked as one of the top mountain biking destinations in the Bay Area. While it may not have as much pure appeal to hard-core mountain bikers as Skeggs Point, Annadel, or Demo Forest does, it has a wider variety of trails compared to them (with sun-baked fire-road climbs, narrow singletrack through open meadows, an easy meander along a bluff's edge, as well as dim wooded switchbacks and technical sections), and it has a higher amount of total trail length compared to places like Camp Tamarancho and Rockville. On top of these, it is on the coast, so beautiful ocean views open up on many occassions during your ride. This ride is a minor variation on what I would call my "main recommended route" in Wilder Ranch. Unlike that one, this starts out on the coast. It follows the pancake-flat Ohlone Bluff Trail for a short while as it follows the edge of the coastal bluff. Other than scoping this trail out for a future ride with casual-biker family members and small kids, and the opportunity for stopping at a couple of small beaches (though that would make even more sense closer to the end of the ride), this trail doesn't have too much to offer a mountain biker. Unless, that is, you count the 180-degree "full-frontal" view of the ocean. Then, you turn inland and pedal past some crop fields (and near some farming facilities) to cross Highway 1 and start climbing on Horseman's Trail. After some ambiguous looking turns (the GPS track might come in handy here), you start a steadier climb on Wilder Ridge Loop. Once you reach the beginning of Enchanted Loop, the rest of the ride follows the same route as my "preferred" loop through Wilder Ranch, also described on this site, so I'd like to refer you to that page for an explanation of the remaining part instead of repeating it here. 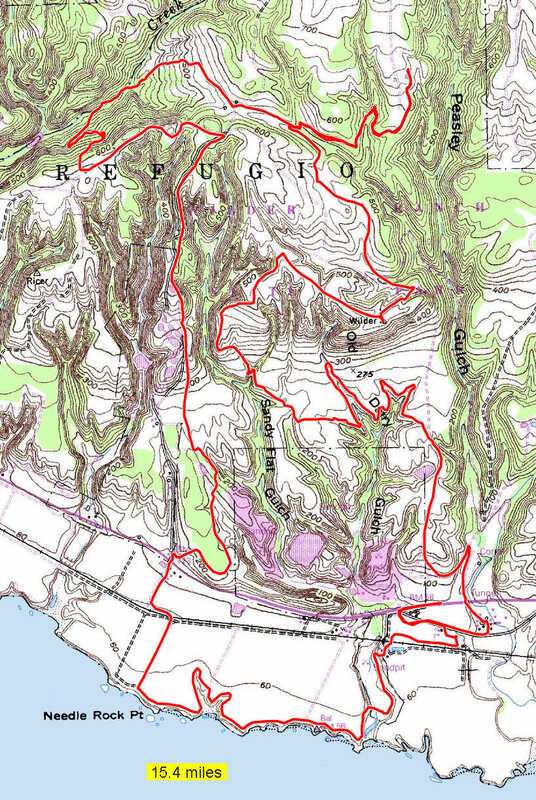 You'll see that the route shown on this page includes an out-and-back spur on Eucalyptus Loop. That's not an essential component of the ride. It's only captured in the GPS track because it was some additional distance that me and my riding buddies felt like adding to the ride at the time. You can save nearly two miles by omitting that part of the route. Note that this ride predates some changes made to Enchanted Loop. The later parts of that loop that are included on this ride are now a very pleasant and gently climbing singletrack that doesn't follow very closely the line of the old, ugly, and steep climb out. 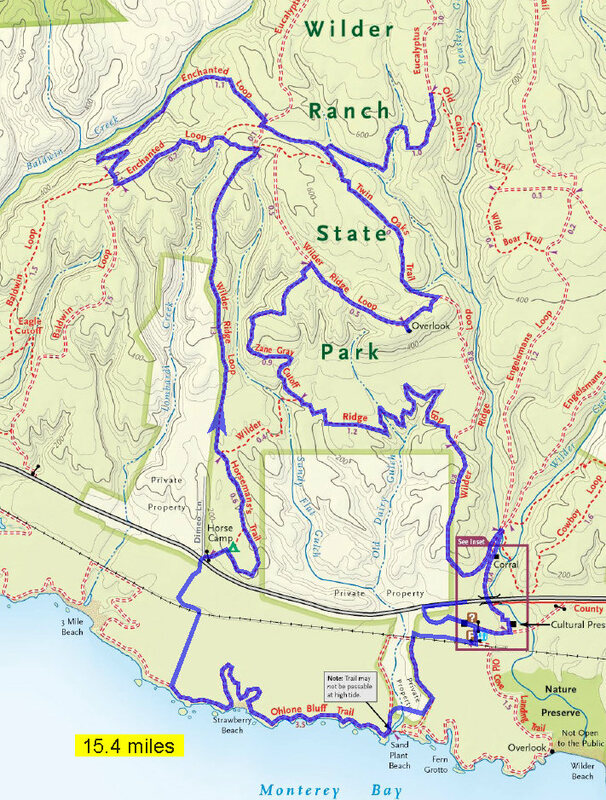 To see the current route and GPS track of Enchanted Loop (not to mention its updated photos), see the "Wilder Ranch (Enchanted Loop via Wild Boar Trail)" ride. At the end of the ride, you'll be walking through historic Wilder Ranch itself, before you make it back to the parking lot. These facilities make quite a few fun and educational activities available to families on weekends. The historic farm equipment and vehicles, and the blacksmith shop demo are definitely worth a look, especially if you're visiting the park with some little ones.